jaylee50, Pi314CA, Sugarlandgirl4life and 5 others like this. Where's TayTay and Miranda? And while it's true about Kelly, it's better that she is there, than TayTay who is lighting the way for nobody. At least all three women do it for the music. CarrieUnderwoodismyHero, underwoodfanfrance, allirishgirl and 1 others like this. One of the "used to be Country to Pop" in exchange for the "used to be Pop to Country".......if that's the case, I guess the Country get a better deal. Schrodinger, allirishgirl, robinannhunt and 1 others like this. Kelly is a good pop artist, but why in the world is she on the cover of Country Weekly? Even Taylor deserves to be there over her. LOL. I know it isn't Kelly's fault country is embracing her, but this kind of thing just annoys me. AdamJ, rainbow1, opry051008 and 1 others like this. I mean I guess I'm just glad Carrie is on there vs being left out. AdamJ and rainbow1 like this. I think Miranda deserves more than Kelly that cover! And the "women in country music getting smaller" sounds like "Taylor is out of country music now"
rainbow1, DizzyDollyDee, Smokyiiis and 2 others like this. Carrie have a lot of presence!!! It's only the cover. You never know what lurks within. Carrieflattsfan and rainbow1 like this. I agree.Miranda and Blake probably don't like this, even though Kelly is their bud. Taytay should never be on anything publication website associated with country music, she should also never be mention in the same article taking about vocalists. And how in anyway is she lighting the path for women of country music, or anyone else, except her self. Granted Kelly is pop, but every country song she's sung, with the exception of MKIA has been been better country music that TayTay, except maybe TimMcGraw though in this case use the world singing very lightly. talk about slap in the face to Miranda. geez. Does Kelly like country? yes, but my god, she's a POP STAR. CarrieUnderwoodismyHero, Schrodinger, Carrieflattsfan and 3 others like this. If anyone happens to pick this up i'd be interested to see what the article says. What’s the reason behind the lack of new country female acts on the charts? And which young females are getting ready to represent the new generation? CW takes on these hot-button questions in a special cover section, which takes a look at three classes of female artists. I actually love that Kelly is on the cover...but maybe that's just me. I find it rather ironic that the cover features Kelly, Reba and Carrie...when the industry absolutely adores Miranda and Taylor....Heh. supercarriefan, teesharky, referee and 1 others like this. Apparently Miranda will be featured in the article according to the CW website description I posted above, but I guess they just decided to to put her on the cover. I agree! I thought at least the two biggest women in country right now were Carrie & Miranda. I mean if they didn't put Miranda on the cover they could have put Martina, Sara or any one of the other women (Jana, etc). Another article: Taylor Passes Connie Smith to Break a Country Record. Btw you can click on some links to read articles. Agree that Miranda should have been on the cover. TS will probably have her very own cover considering her latest "record" article. 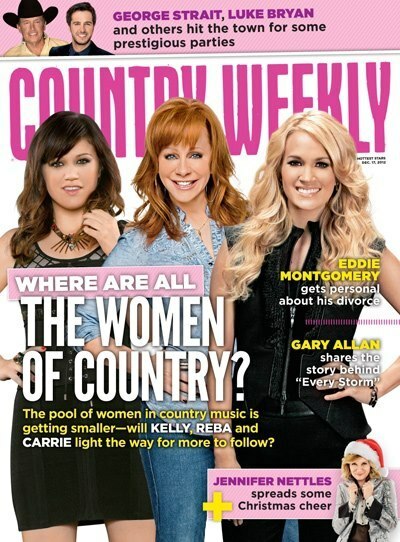 The new Country Weekly cover is a story asking "Where Are All The Women In Country?" The cover features Kelly, Reba, and Carrie, and you can see the cover here. Carrie's blurb talks about how she's been able to keep older country fans happy by not shying away from the country traditions of songs about cheating (like Before He Cheats), drinking (like Last Name), and revenge/murder (like Two Black Cadillacs) while attracting younger fans with her contemporary sound. Carrie's multigenerational appeal among country fans is something I'm glad people are starting to recognize and try to explain (Country Universe's founder also pointed this out in his recent review of Carrie's show in Newark NJ). Carrie's been connecting the traditional to the contemporary in country in a pretty specific way pretty much since she started out. The Kelly/Kellie joint blurb gives a little more ink to Kelly, mentioning her duets with Reba and Jason, MKIA, and now her single Don't Rush with Vince. Kellie's portion mentions she's had several hits and how her 3rd album proved she's country to the core. Carrieflattsfan, liz278, Pi314CA and 5 others like this. Kelly totally shouldnt be on there!